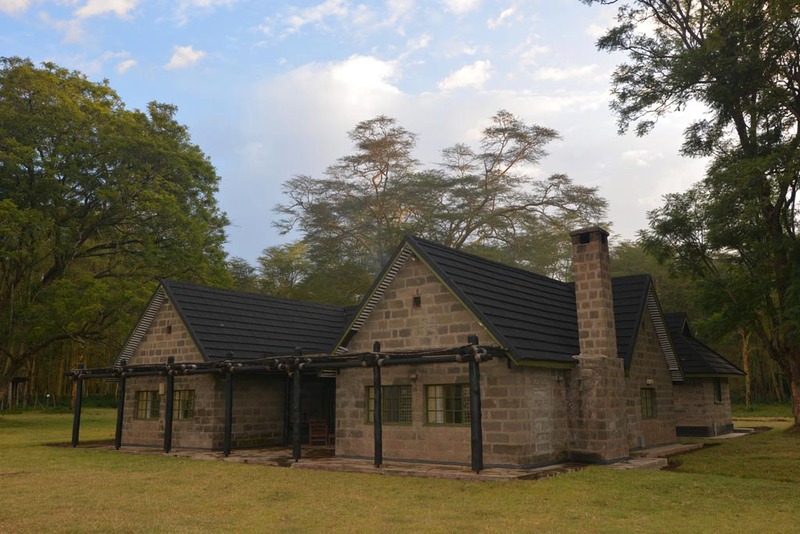 After four days of bush camping in the Masai Mara, we look forward to a warm shower and sitting around the fireplace at Naishi Guest House in Lake Nakuru National Park. Livingstone the warm and friendly caretaker waits for our arrival and welcomes us like family. He has the fire stoked for heating our shower and proudly shows us around the house. 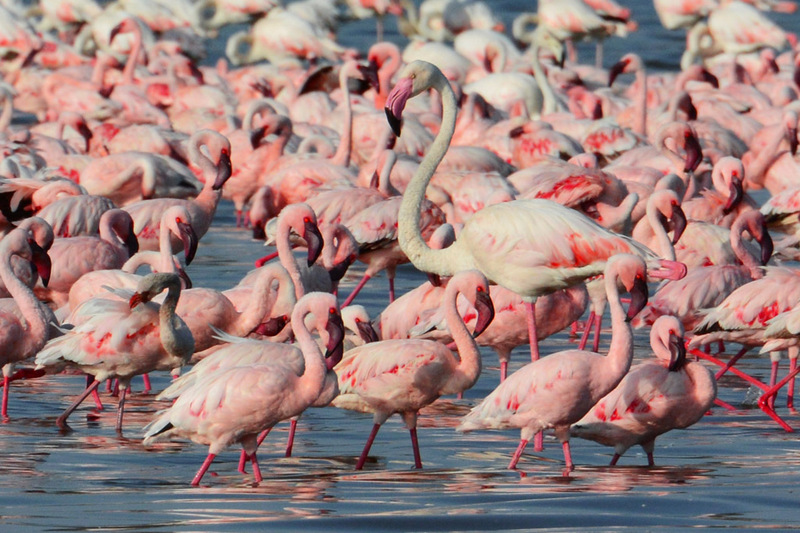 Lake Nakuru has more going for it than just flamingos. 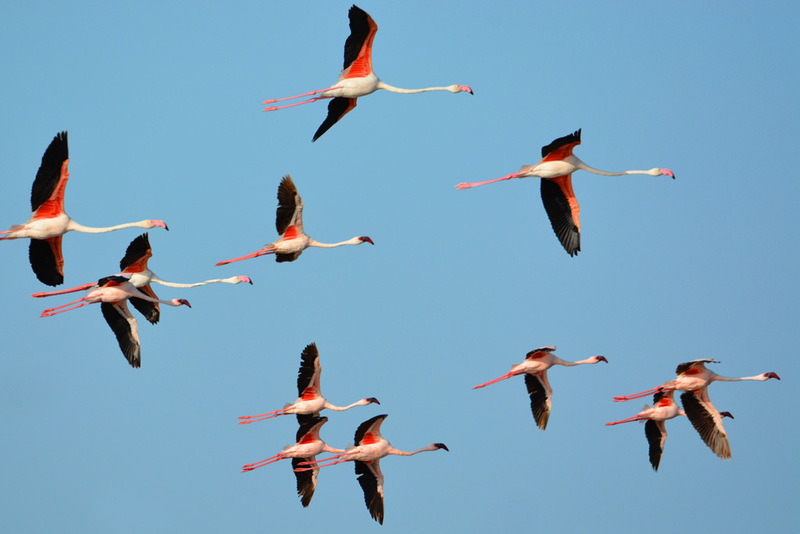 Famous for the millions of flamingos that once flocked to the shore, Lake Nakuru is one of Kenya’s smallest national parks and on the floor of the Great Rift Valley. Due to climate change, floods and extreme variations in the seasons the flamingos location can no longer be guaranteed. However, the park has more going for it than flamingos and by the time we leave, Lake Nakuru is one of our favourite places and we could easily spend more time here. We love the guest house. Once the home of the park warden, the charming and rustic house is now rented out to guests. Two gorgeous, spacious bedrooms have their own bathrooms and at the back another two single bedrooms with their own bathrooms. The timber kitchen is fully equipped with everything that Sammy our cook needs to cook up a storm. The house has a traditional ‘makuti’ ceiling and slate tiles throughout. The living area features a wood fireplace and leads out to the veranda, which has views of the national park. It is from the veranda that we see a lion. Unfazed by being so close to the guest house, he sits about 50 metres away and watches us. Due to his cub-chewed ears, scarred body and weary eyes it looks like he has seen his share of battles. It is sad that he is probably on his own now after being ousted from the pride by younger males. Acacia trees surround the guesthouse and from our bedroom, we watch the vervet and colobus monkeys climb the trees. The windows on the house have security bars to keep the vervets out. At night we sleep with the windows open to the icy chill of the savannah and the deep, throaty roaring of the lions. We leave the cosy guest house at dawn for our first safari. With the icy air blowing in our face it’s exhilarating watching the sunrise and our first wildlife encounters of the day. After a couple of magical hours, we go back to the guest house and have breakfast. Sammy cooks the most mouth-watering breakfast of freshly brewed coffee and pancakes with fresh fruit that we bought at the local markets. We do another safari after breakfast and return to relax around the guesthouse and have lunch during the hottest part of the day. In the afternoon, we do another drive and stay out in the park until after sunset. 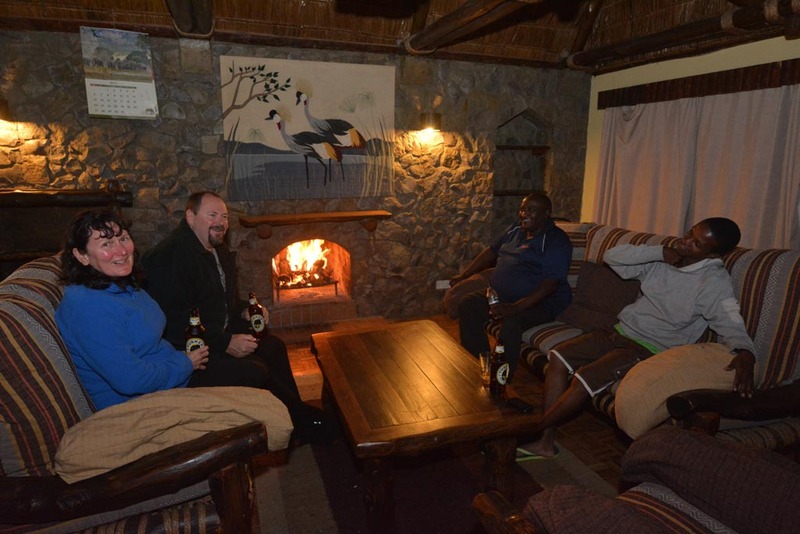 At night we relish Sammy’s cooking and all sit around the fireplace and enjoy cold local beers. 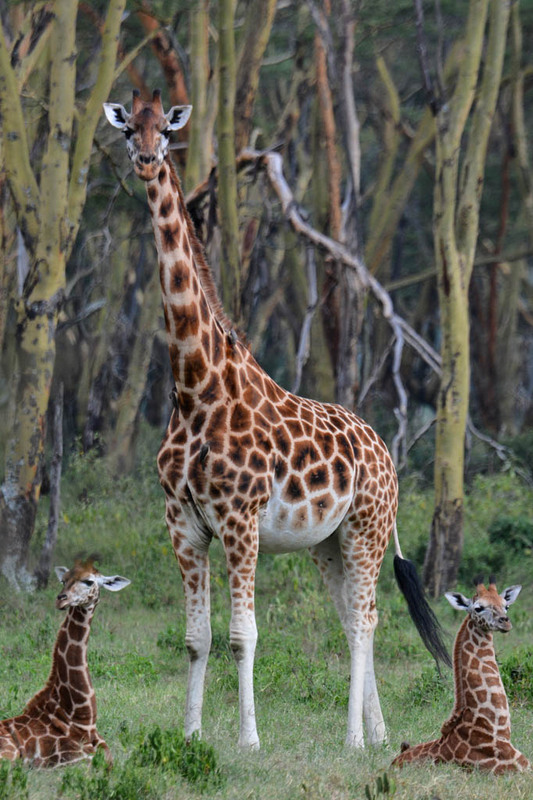 We are not sure if these Rothschild Giraffe babies are twins. We could spend days here driving around watching the Rothschild Giraffes. Endangered and only a few hundred of them left, they were brought here from the west of Kenya in an effort to conserve them. 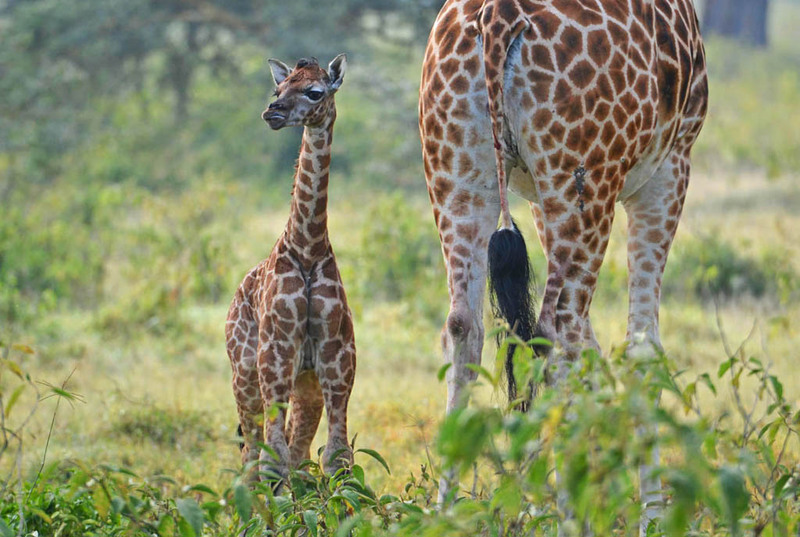 Unlike the Masai and Reticulated Giraffe, they have no markings on their legs but have cute ‘white socks’. The baby is barely hours old. 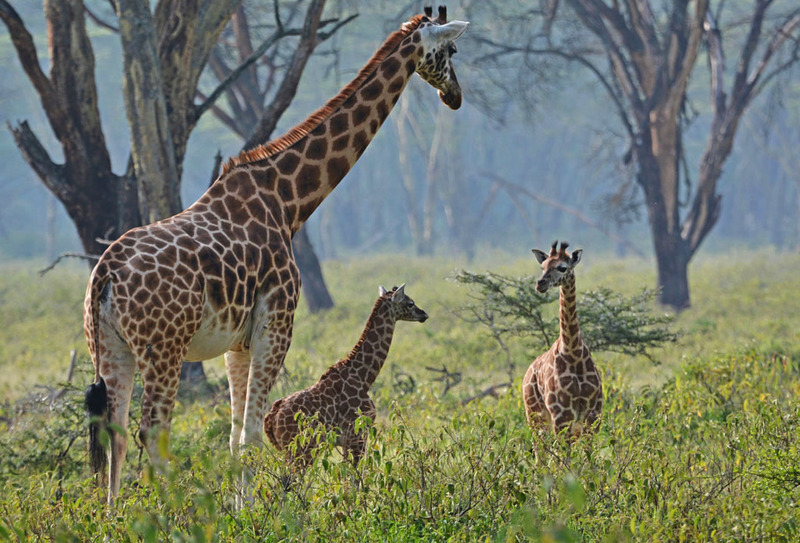 When we see a giraffe herd with two babies who are no more than one-month-old and a newborn baby, we are spellbound and spend hours watching them. Mum is ready to kick with her powerful legs anything that comes close. The two older babies run around and play and are so cute with their spindly legs. We are not sure if they are twins or with an adult on nursery duty, but whoever she is, she takes guard duty seriously and watches us closely. In the same group, a baby is born. At only a few hours old, she still has her umbilical cord and her little body is all out of proportion. Her beautiful dark chocolate eyes look over at us and she is aware of our presence as mum’s long neck bends over and licks her orange spotted coat with her long tongue. Not much bigger than the newborn, the baby comes over for a look at his new playmate. The mother bonds and guards her vulnerable baby, and she is ready to kick with her powerful legs anything that comes close. She makes an exception when receiving congratulations from other giraffes and the frisky older babies who want an introduction with their soon-to-be playmate. This handsome Impala had to fight off a bachelor group who were trying to take over his harem of girls. Zebras, impalas, waterbuck, buffalo and rhino graze in the golden grasslands. 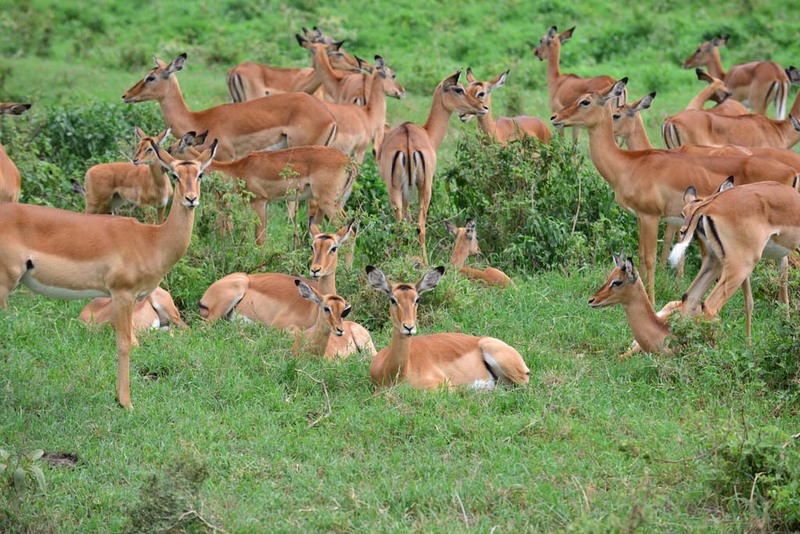 A group of bachelor male impalas try unsuccessfully to take over a harem of girls. From the open grasslands, it changes to more dense forest and bush landscape and baboon gangs look for trouble while sitting on the roads and watching the vehicles go by. Two lionesses intently watch us while they laze in the tree branches and cute jackal pups poke their heads out of their den beside the road. A leopard lazily reclines in a yellow barked acacia tree unaware of the excitement he’s caused. The rare Rothschild giraffe chomps on the leaves in the acacia tree forest, shadowed by rocky cliffs and hills. 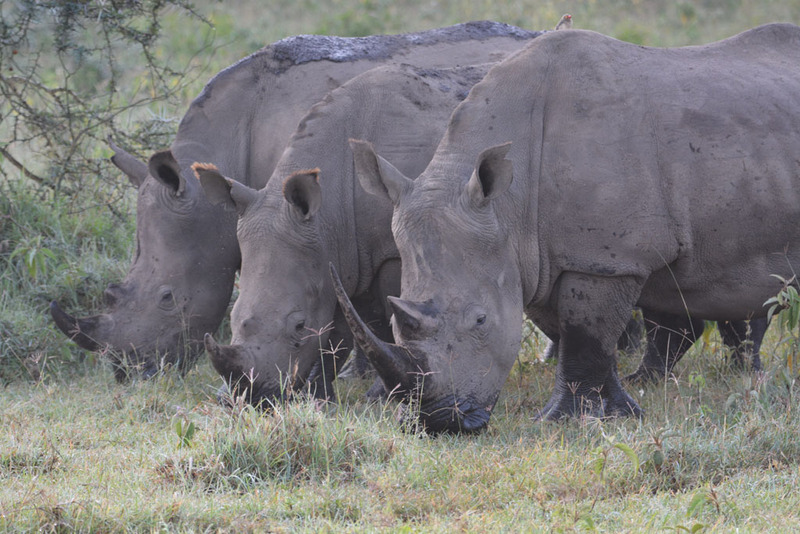 The park has the largest population of rhinoceros in Africa which includes the black and white species translocated here in an effort to protect them and monitor for poaching. We see many white rhinos but no black rhinos as they are more difficult to spot and prefer the dense bush area where the white rhinos prefer the open plains. We couldn’t believe the cute squeaky sounds they make. One morning we are so close to a group of five rhinos that we can hear their little squeaky sounds.When you are that big you can get away with sounding like a squeaky toy! 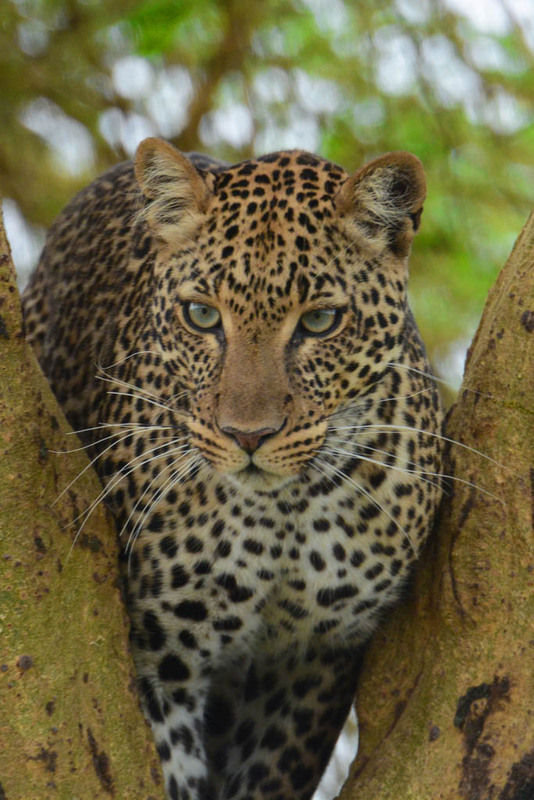 Lake Nakuru is also one of the best parks to spot leopards and we see two during our visit. One was up a tree and the other was hiding in a bush watching impalas play right in front of him while they were oblivious to his presence. 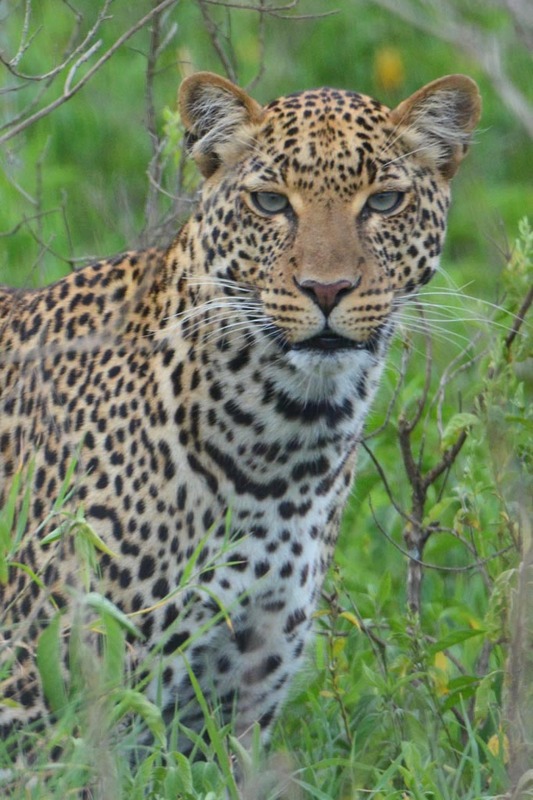 These leopard encounters were a real bonus because they were the most unexpected of all our sightings. The park is one of the best places in Kenya to spot leopards. 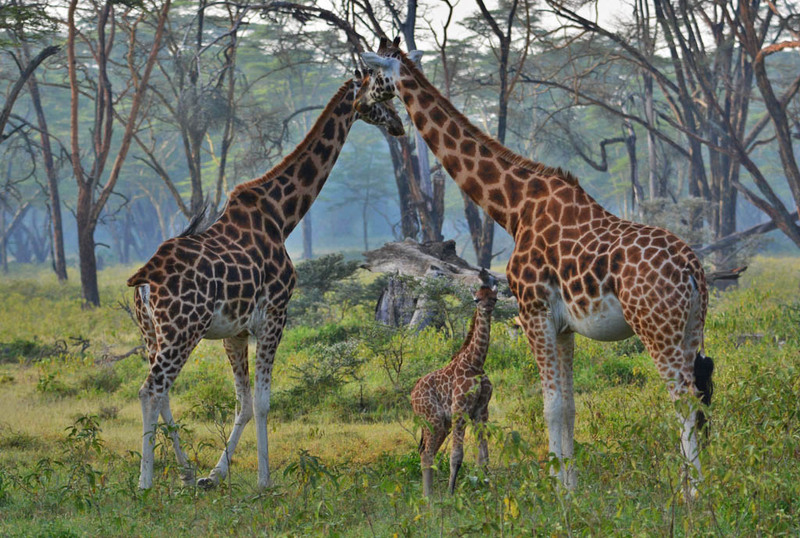 Lake Nakuru National Park is a small park, but it has a lot going for it. Most tourists visit here on a day trip and overnight en route to Masai Mara without spending much time, which is a shame because though different we see just as much wildlife here as in the Masia Mara. 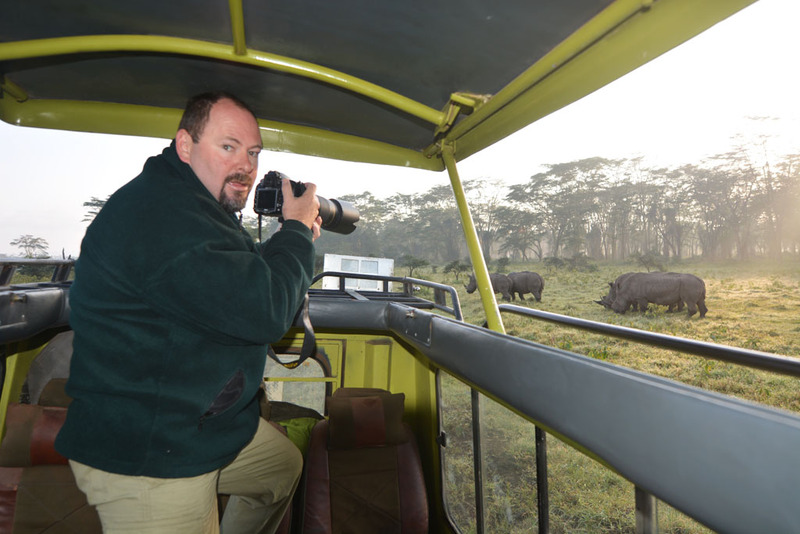 Because Lake Nakuru is fenced to protect the endangered giraffes and rhino, there are no elephants here. 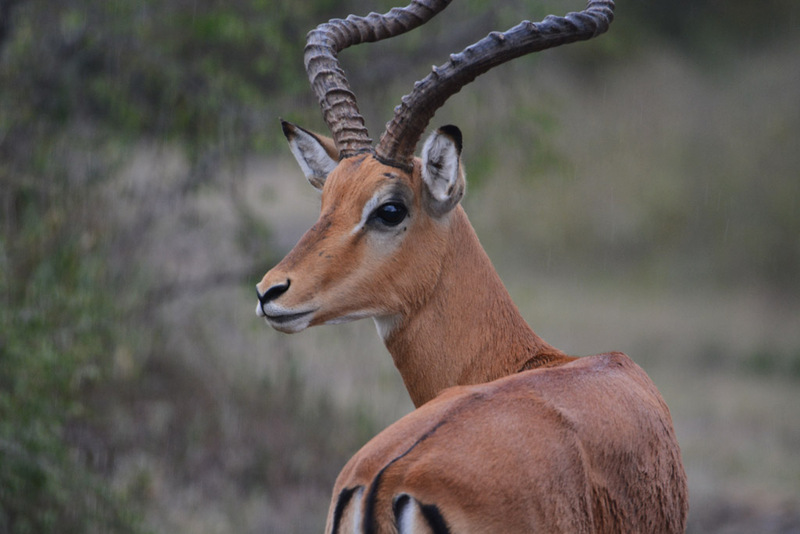 Impalas are the most common antelope species at Lake Nakuru. Though the park doesn’t have the flamingos it once had, hundreds of species of birdlife and other wildlife can be seen here. It also has the added bonus of being away from the crowds which make all our sightings crowd-free and mostly on our own. Sue, Ray, Sammy & Martin. We will always have great memories of our trip. 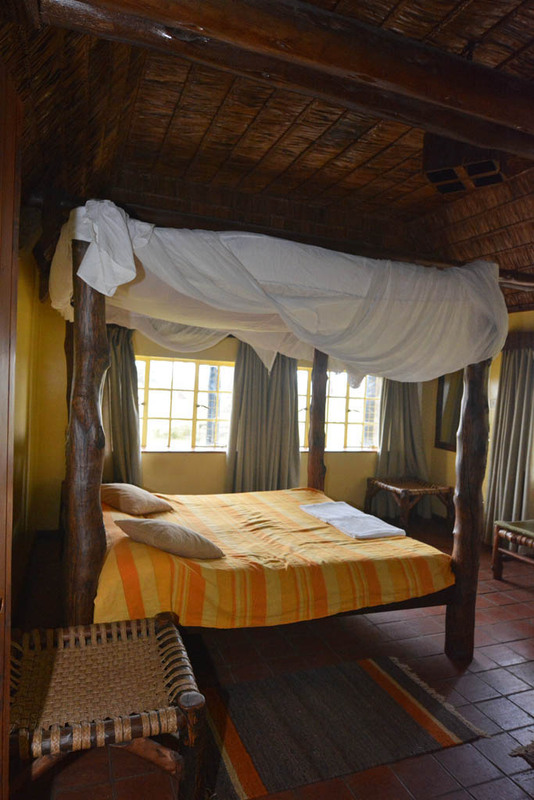 Naishi Guest House is self-catering and owned by Kenya Wildlife Service. The flamingos at Lake Nakuru aren’t accessible during our visit so Martin our guide makes a phone call and confirms they are at Lake Bogoria, one of the lakes they have migrated to which is a couple of hours away. 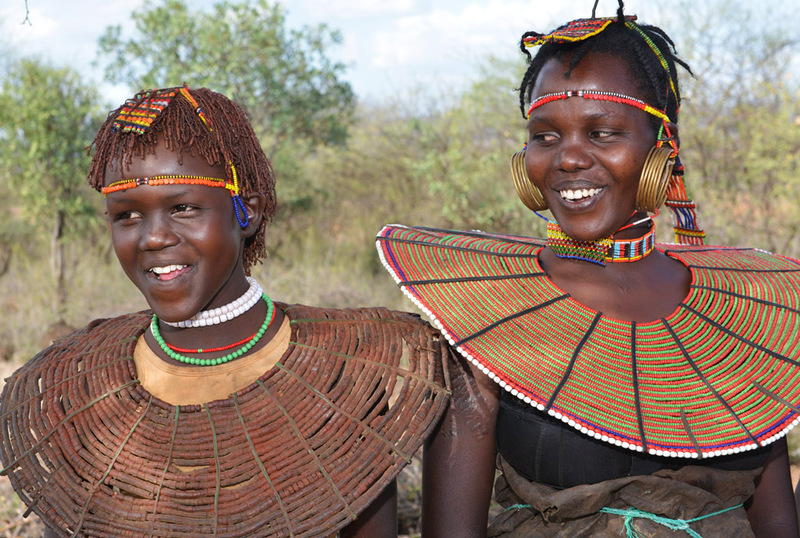 We have the option of leaving Lake Nakuru in the early morning for a day trip or camping overnight at Lake Bogoria, so we decide to camp at Lake Bogoria because this makes it possible to visit the Pokot tribes around the Lake Baringo area. Rarely visited by outsiders, it is a unique cultural insight because they have mostly stayed with their traditional ways. It is a very interesting and humbling experience to visit the village and learn about the tribe’s culture and how they live their daily lives in the harsh arid land. 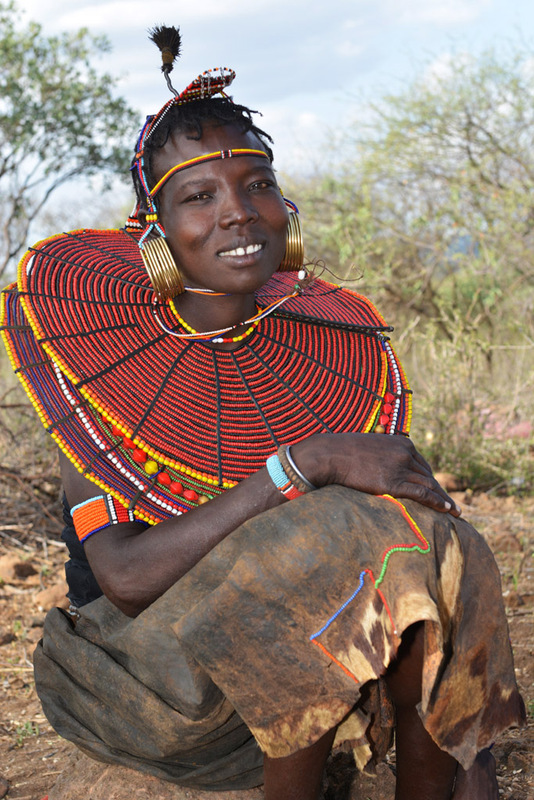 The Pokot tribe have kept their traditional ways. 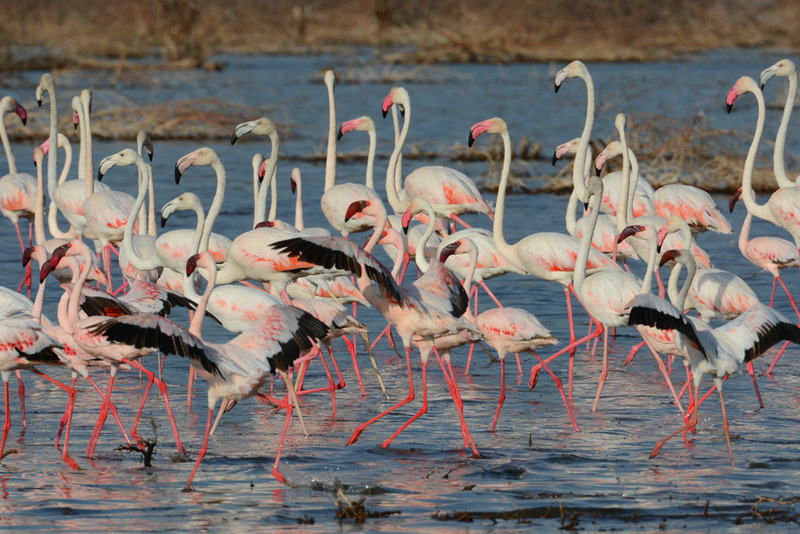 Though the flamingos are nowhere near the numbers they once were, the sight of these leggy, pink fluff balls on the shoreline is enchanting as they come together from all directions in a display of colours from candy pink to burnt orange. Though not in the numbers they once were, it is still a sight to behold. They communicate with grunts, growls, and honks, so it’s noisy. If spooked, the sky becomes a pink blanket when they flock together as one to the middle of the lake and restart the process of marching in unity back to the shoreline. 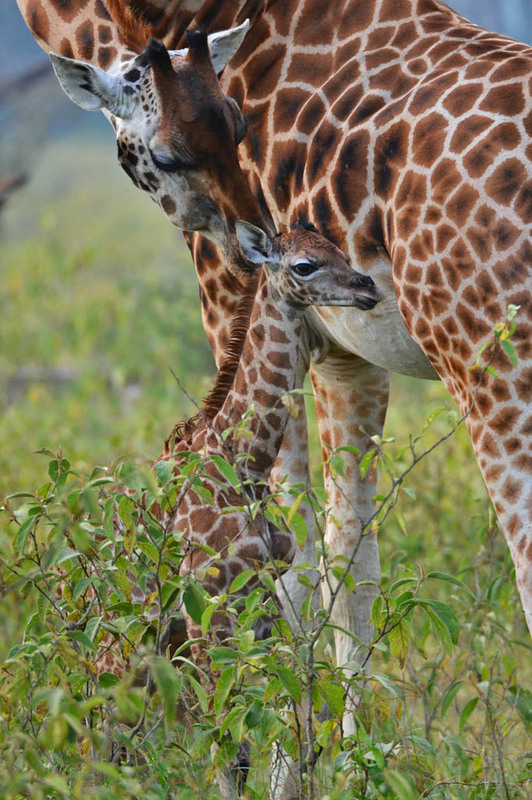 A newborn Rothschild giraffe is a highlight for us. 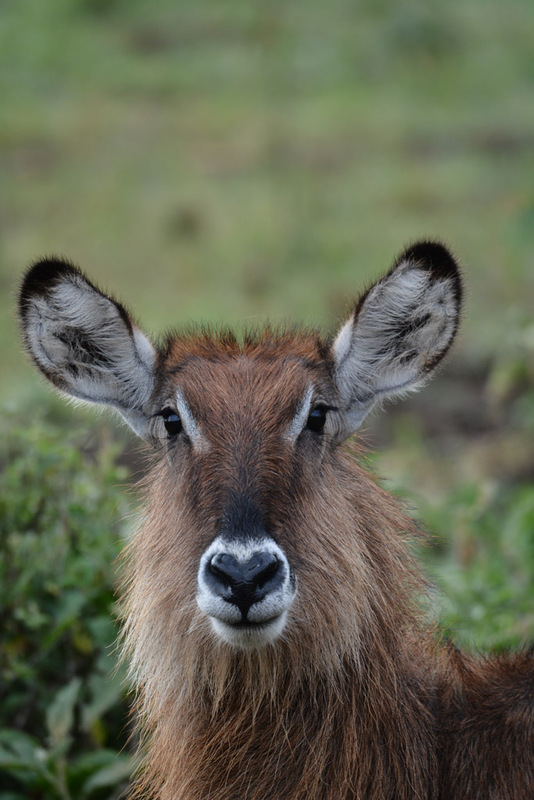 A shy female Waterbuck. One of the many different wildlife in the park. 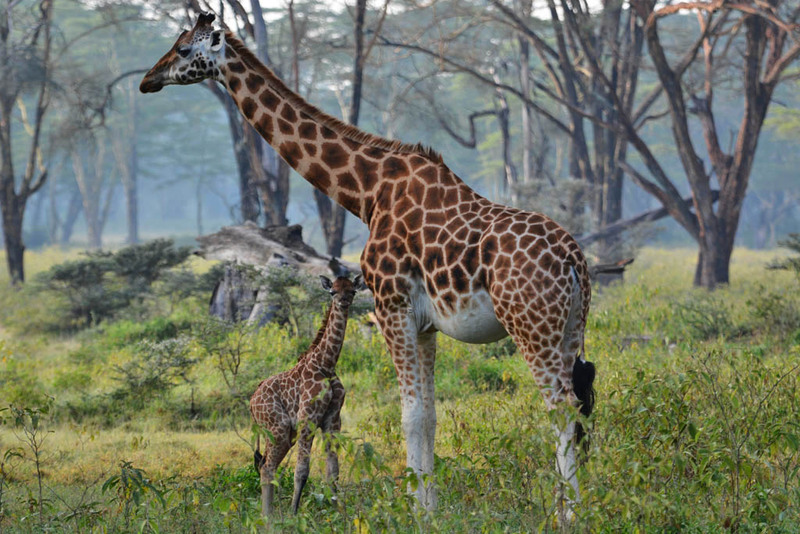 Some of our best memories of our Kenya trip are the giraffes at Lake Nakuru. Absolutely amazing! I actually have a friend looking at going over to visit the giraffes and I was wondering if you’d be able to reccomend the best places to go? Thanks Braeden. There were Giraffes at both the Masai Mara and Nakuru. Masai & Reticulated Giraffes at the Masai Mara and the Rothschild at Lake Nakuru. During a few days stay you will see them for sure. Absolutely amazing and beautiful photography! I love to follow your adventures through your photos! Thanks for your comments and following us Samantha! You really do a wonderful job Of describing everything . Your photography is always so amazing. I love to see your photos after every trip you do. Keep it up. Thank you for sharing. Hi Dianne. We try and describe it exactly how it was – magical. Thanks for reading our blogs. 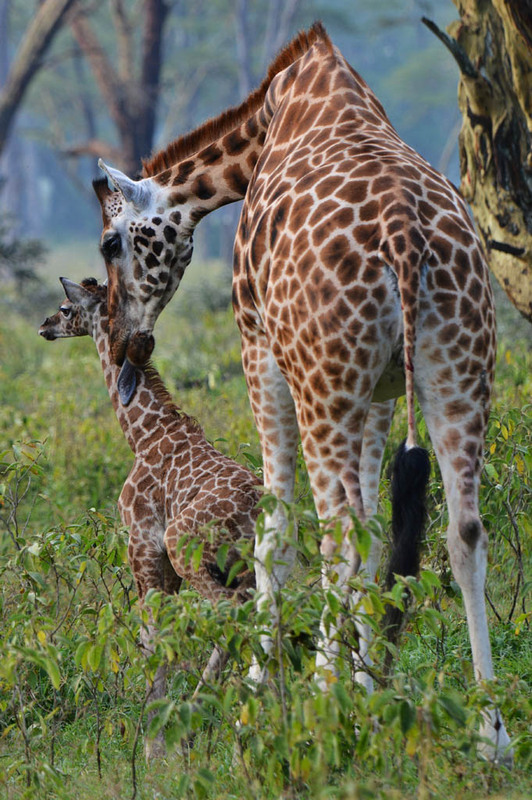 What a special experience to capture a baby giraffe. Thank you for opening my eyes to a “different” perspective of Africa. This national park looks so different and lush. Amazing. Hi Vicky. Lake Nakuru shouldn’t be left off the itineray for a trip to Kenya. It is a beautiful little park. All the parks are different and can’t be compared. 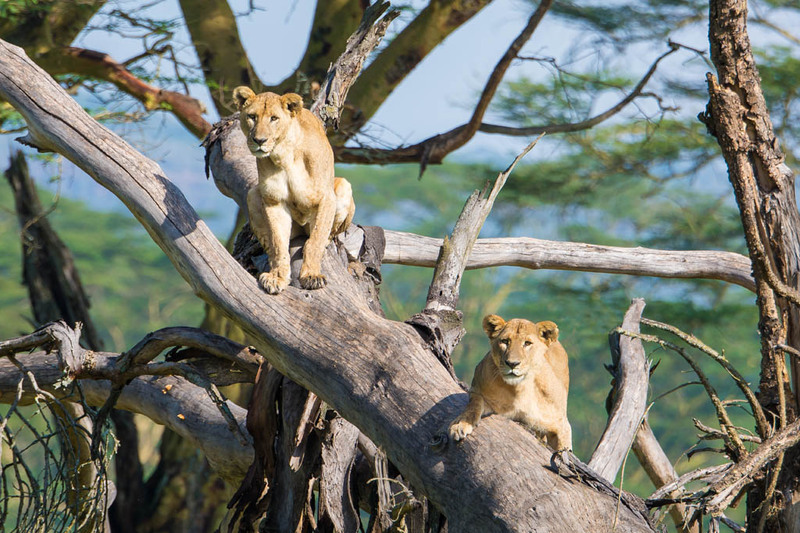 We found you could get close to certain wildlife in Masai Mara that you couldn’t in Nakuru and vice versa. Make sure to put it on your list! Thanks for visiting our site and your comments. Great pictures, great stories, and great fun! Wow, you two take such incredible photos. It was such a pleasure having the opportunity to meet you while in Thailand. That Waterbuck is so beautiful. Hopefully our paths will cross again sometime. Great to hear your comments Giselle and Cody. We were just talking about you the other day, saying exactly the same thing. We hope our paths cross again soon in our travels. Thanks so much! Thank you for taking me on this adventure with you through your photos! I was unable to visit Lake Nakuru when we were there. We had wanted to go and see the flamingos as well. With photos like these, this area is definitely on my list for my next visit! Hi Julie. Thanks once again for your comments. We were lucky the Flamingos were at Lake Bogoria and also lucky that we had Martin for our guide because he tracked the Flamingos down! On your next visit definately leave a day open for the possibility of sighting them. How intimate and beautiful You make any part of the world you are in. But you have outdone yourselves this time! It is so special! And easy to see that this is a dream trip for you. Your intro blog shows the anticipation of discovery, the love! And the photography unfolds it brilliantly (and wouldn’t disgrace even the famous Attenborough shoots). It is a very real gift to those of us who will never see such wonders in the flesh. Not sure I would have the fibre to ‘relax’ in a (ground floor!) residence with wild lions roaming the yard! But it is brilliant to share the experience through your eyes. I doubt I would see the souls of the animals as you do, through my own. 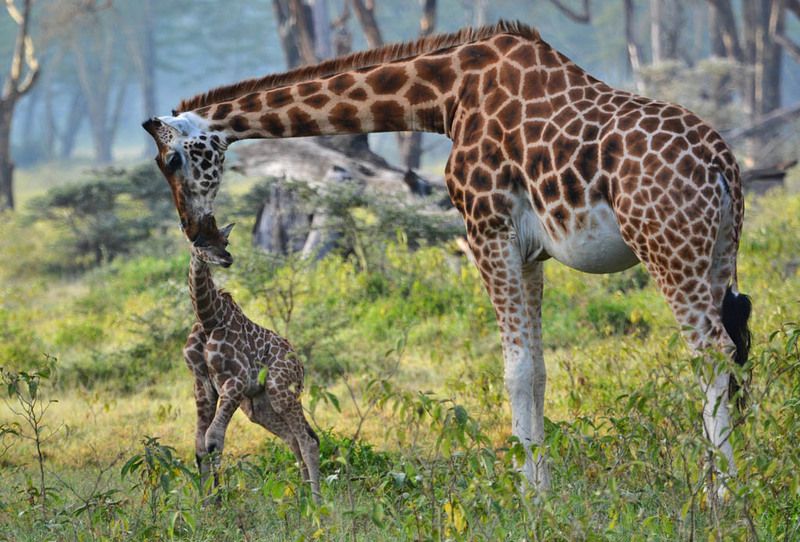 Aww the baby giraffe is so precious! Well done. Thank you for sharing. Thanks Marie! Lake Nakuru is a special place to visit and it’s not hard to make it look beautiful. 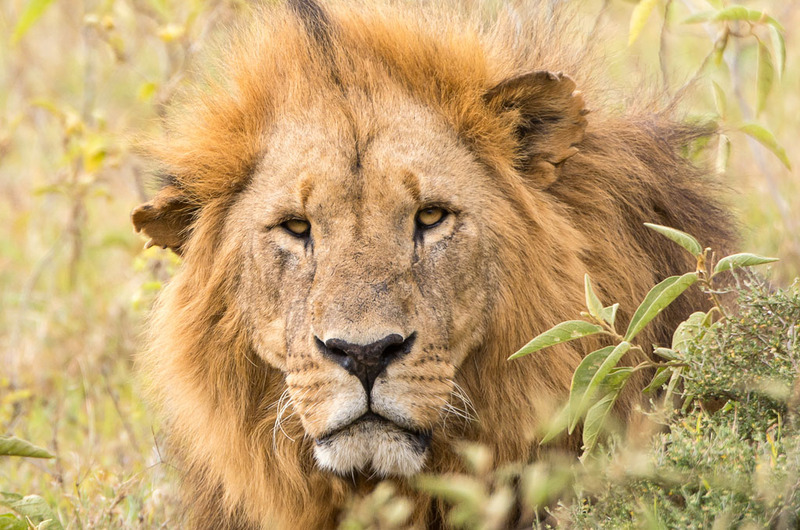 Once you are there listening and seeing the Lions and other wildlife it is very exciting and you don’t worry about it at all. That is one memory that stands out to us, the Lions so close to our guest house and listening to them roaring at night from our cosy bedroom! Such GREAT pics – so wonderful – thanks guys — do you sell images so I can use online ? Hi David. Thanks for your comment & visiting our website. All our images are for sale in digital format too. Please get in touch with us, as we would love to work something out with you. Very amazing pics, and story, the leopards one are my favourite!! Thanks William. The Leopard is one of our favourites too! Lake Nakuru is beautiful & worth putting on your list.